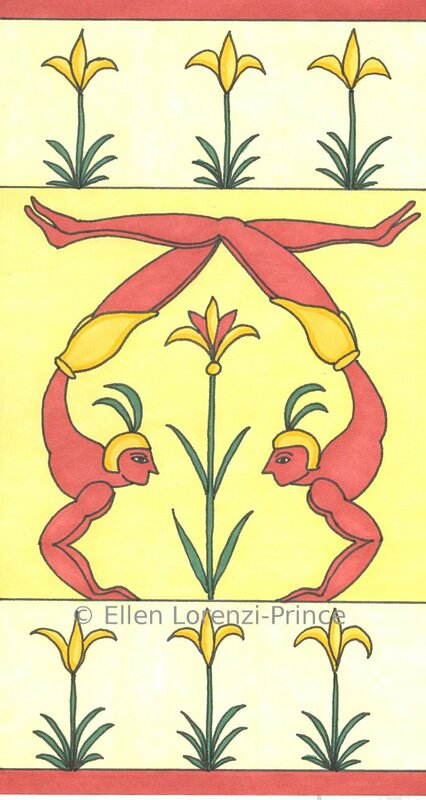 Each card of the Minoan Tarot is based upon an original work of the painters, sculptors, jewelers and potters who lived thousands of years ago. Unlike their contemporaries in Egypt or Babylonia, the Bronze Age people of Crete did not exalt kingship, war nor death, nor conceive of a vast distance between Gods and humanity. Instead these people celebrated the presence of the Goddess, the beauty of the natural world, and their own sexuality and creativity. 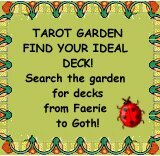 The Minoan Tarot describes a lively, peaceful, sacred, and technologically advanced society, that is no fantasy but is part of our true history. The following images were chosen to highlight three different forms of Minoan art that have been used as inspiration: faience, engraved gem, and fresco. 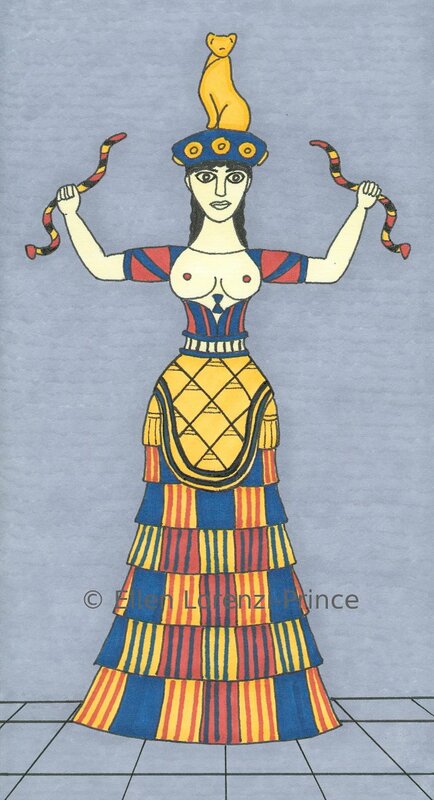 The source of this image may be the most familiar Minoan artifact, the Snake Goddess figurine from New Palace Period Knossos. The figurine is about fifteen inches tall and made of faience, baked clay mixed with ground quartz and other minerals. 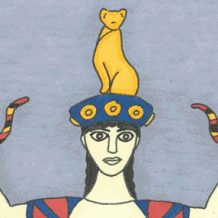 The Oracle brandishes brightly colored, likely poisonous snakes, recalling the ancient seers throughout the Near East who trained their bodies to tolerate snakebite, and transmute the toxin into powerful visions. Her outlined eyes stare at the invisible, her cupped ears listen to the language of the snakes, and her lips part to speak. A cat sits on her head, watchful and grounded, the guardian of her unusual powers of perception. The Oracle serves those whose questions cannot be answered any other way. Every petition is accorded equal dignity. Her process is respected. Truth or myth, she speaks what she sees without shame, judgment or mercy. In this engraved gem seal from Knossos in the Old Palace Period, two acrobats standing on their hands mirror each other, creating a composition of symmetry and grace. Their maneuver is a physical practice, but it is spiritual as well, as shown by the sacred lilies that crown and surround the men. 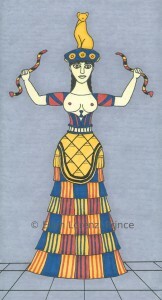 The Minoans valued both joyful physicality and deep religious feeling, and sought this balance in their daily lives. In this image of Balance, effort is made to match strength to strength to create equilibrium. Adding weight to one side would collapse both, as would a moment of weakness or inattention from either of the acrobats. Body and mind must be balanced within each individual to maintain this awareness, and each must be as cognizant of the other as he is of himself. In Balance, no one thing is of greater worth than the dynamic process of creating harmony and stability among two. The suit corresponding with the element of air is the living realm of the Sky. The Minoans had no known numerology, so a classical assignment of qualities to numbers has been used. There are no symbols to be counted in the images, nor is the number of figures an indication of the card’s designation; the Minoan source works were not adulterated to provide this. The images are assigned to the cards by the correspondence of their energies alone. 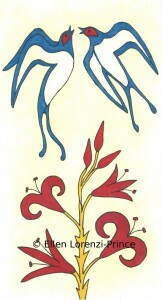 The key concept for Three is Creativity, and the Sky Three card shows a pair of swallows swooping and dancing on a New Palace Period fresco. The painting celebrates spring in all its glory: the mating season, the quickening of the light, and the impulse toward new life. The swallow is the ultimate harbinger of the beautiful, vital season with its swift, spiraling, and elegant flight. Swallows mate for life and return to the same nest year after year. Their return en masse to their nesting sites was as moving an event in ancient times as it is today. In later myth, this passionate bird was associated with Aphrodite, the Greek Goddess of Love. In Egyptian and Sumerian mythology, cultures contemporary with the Minoan, swallows represented the ancient mothers of creation. 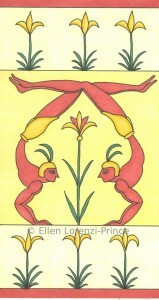 The Minoan Tarot will be available this summer from Tarot Media Company. (http://tarotmediacompany.com/) You can see more of Ellen’s work here.